Type in the modpack name (PROMETHEUS RISING [AVP]) or paste the following url into the search box. Finally, click Install at the bottom right of the launcher after you select PROMETHEUS RISING [AVP] from the list on the left. The launcher will handle everything else! 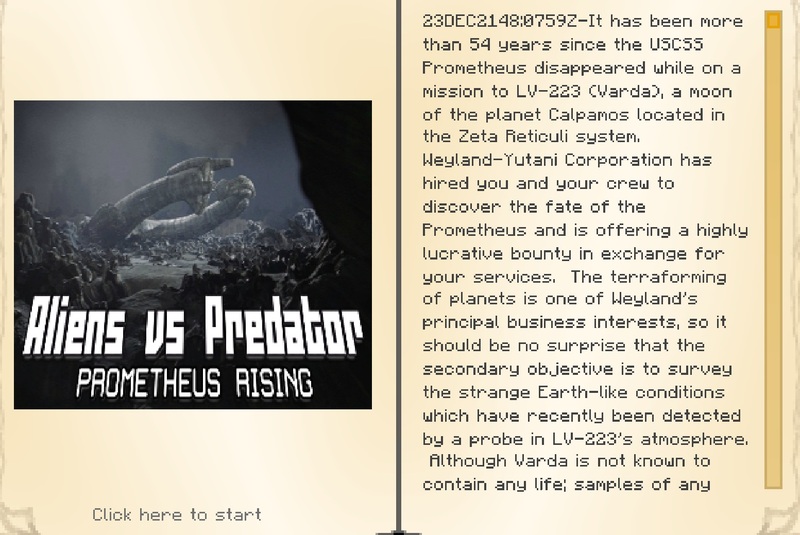 In this terrifying sci-fi horror adventure set in the Aliens vs Predator Universe, you play as a scientist on a mission to discover the fate of the USCSS Prometheus and her crew. When waking from cryosleep, you and your crew find yourself scrambling for your lives as your own spaceship is shot out of the sky by something on the ground. Survive on the moon LV-223 Varda from the movie Prometheus with your friends in multi-player or alone in single-player. Use science to unlock the secrets of Colonial Marine, Predator, Engineer and Alien technology. Research the Assembler and locate Yautja Artifacts that will allow you to create Predator armor which allows you to see in thermal and electromagnetic spectrum. Wear Alien armor that allows you to scale vertical surfaces like an actual Xenomorph. Use science and the power of your mind to research and design your own custom spaceship to escape the hostile world. As the ships civilian science officer (and crew in multiplayer or LAN), you are adept at many sciences including chemistry and computer science. You as the player must learn and use these sciences, and many more, to survive and eventually escape LV-223 (Varda) in a custom spaceship of your own construction. You are given three lives to complete this mission. However, as you complete each quest and its associated tasks, you will be given a choice to receive either a partial heart (life) or an item. Most of the time, it is wiser to take the hearts; but sometimes you will want to take the item reward for one reason or another. For instance, if you like the idea of making your own village of humans on Varda; you would want to take the villager spawn eggs reward for the quest called “Let There Be Light!” (Lumium crafting quest) instead of the 3/4 heart. In the same way, Earth animals don’t spawn on Varda so you will need to either take the spawn eggs as quest rewards (once you reach that quest) or try to discover alternate ways of creating those Earth resources while on Varda. Hydration – the water on Varda is not fit for drinking and must be purified through boiling in a furnace or cauldron. A Camel Pack may be crafted as a way of staying hydrated long-term. Air Quality – the air on Varda is only breathable while in the vicinity of trees with leaves. While mining, you will need to craft a Respirator and air filters so that you can breathe for long periods of time underground. Another alternative is to carry logs and leaves with you and set up ‘breathing stations’ underground while mining. The use of torches, furnaces and the proximity to lava will also quickly deplete air quality in an area. Starvation – food on Varda is scarce, so you must quickly master the art of fishing or quickly develop agriculture. Fishing is actually the quicker route, which the quest called “Teach a Man to Fish” will illustrate. The quest book also now has optional early food rewards for completing quests which will keep you alive longer until you can establish a food system. Weather – Storms with high wind, hail and tornadoes are to be avoided; but do not destroy blocks. Be careful as a strong gust of wind can carry you away or smash you against the rocks. Hail will also damage players. Black Mutagenic Goo - careful not to touch this material as its effects are unknown, but surely toxic. Hammerpede – snake-like creatures typically found close to mysterious ampules containing the mutagenic black goo. Deacon – originally the product of an Engineer impregnated by a Trilobite, these monsters are very fast, can climb vertical surfaces and charge at you. Trilobite – can climb vertical surfaces like a spider and has a leaping attack. watch for these things dropping down onto your head from above. Aethon - black goo infected flying alien based on HR Gieger's paintings, run if you see one! Yautja (Predator) – deadly and fast, these hunters want your head as a trophy. if you show them submission though, they might let you live. Beserker Yautja (Mr. Black) – a boss Predator. Engineer – mysterious beings that were the reason for the Prometheus’ original mission. Space Jockey (Engineer with space helmet). Deacon Shark – there are rare ores and fish to be found in the watery depths, but beware of the creatures that hunt there; for they might think of you as dinner. Goo Mutants - you may encounter other bipedal creatures, possibly even humanoid, that have been infected by the black goo. They have a special attack and drop leather when killed. Octohugger - pod-like creature that will impregnate creatures, monsters and players with a parasite. Ovamorph - only found in dungeons and cave systems. If you have seen the Alien movies, you should know what to find inside them! Varda Trees – alien forests cover much of the landscape and produce wood logs and sticks like regular trees would. Geodes – geodes are found everywhere on Varda and contain valuable minerals, as well as the mutagenic black goo. Coal, Iron, Uranium and Diamond - these materials may be found by mining below ground (60Y). 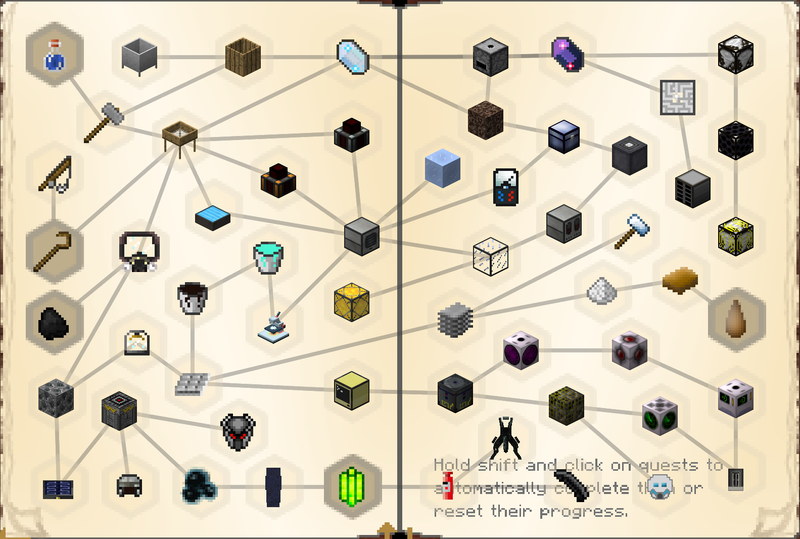 Earth, Nether, End Resources – Earth resources such as redstone, gold, lapis and other materials can be gained by using a sieve (follow the quest book) by sifting materials such as dirt, gravel, sand and dust. Craft a Hammer to crush cobble into gravel, gravel into sand, sand into dust. Sift the dust for rare resources, or use it to create new materials in a composting barrel. Glixyl.org and AliensVsPredator.org are not-for-profit hobbyist gamers looking to bring fun, education and excitement about science to Minecraft.